Well, I went for it. I used about three tablespoons for a front-loading washer. The soap took longer to slightly dissolve in cold water — not so much that it left any soap behind, but I did see flecks of soap in the cold water wash when it went in. (In the warm water wash, the soap dissolved right away.) It was very low-sudsing, which gave me pause, but everything came out really clean. I noticed one of my husband’s shirts had a ring on the collar, which I would have treated if I had seen it earlier, but I just stuffed the shirt in the washer and hoped for the best — totally gone! 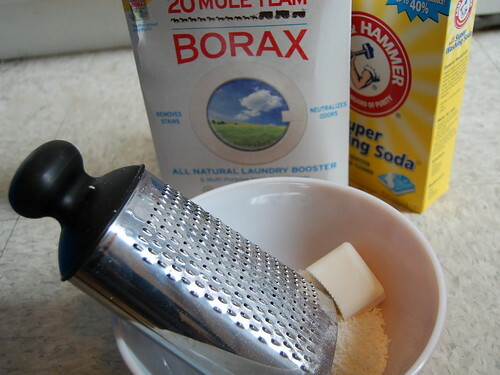 I don’t have a kitchen scale to measure exactly, but estimating by volume, I used about $0.33 of the borax and $0.32 of washing soda, mixed with one bar ($0.46) of soap, that’s… $1.11 for about 20 washes, or $0.06 per wash. By comparison, the Seventh Generation detergent I had been buying sells for $5.48 for 32 oz. on Alice.com, and is good for for 32 HE loads ($0.17/each) or 21 regular loads ($0.26/each). Assuming my estimates aren’t wildly wrong, I think I could even switch over to less crappy soap and still be paying less. Hooray for being cheap! That is a great way to save money. I’d never thought of making my own laundry soap. Will I try it? Not sure yet. I forgot to mention it in the post, but that batch took me maybe 20 minutes, tops. Grating the soap takes the most time but it was a pretty simple process. Just made up a batch this morning. I’ve been making it for 8 months or so and we love it. I just use whatever soap I’ve been able to snag on sale.